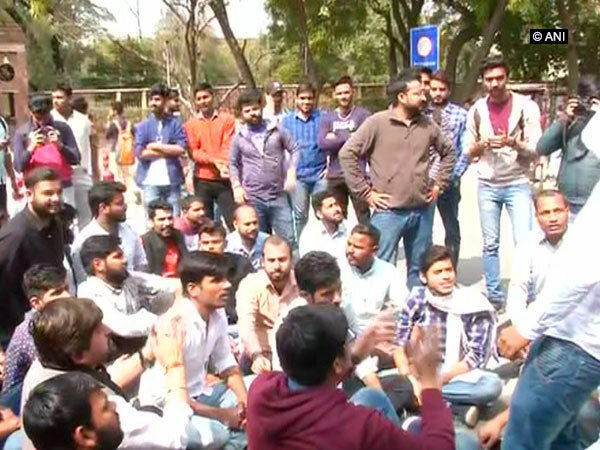 New Delhi [India], Mar 5 (ANI): Akhil Bharatiya Vidyarthi Parishad (ABVP) on Tuesday protested against Delhi University's Vice-Chancellor Yogesh K Tyagi for non-implementation of various demands of the students. New Delhi [India], Jan 16 (ANI): DUSU vice-president Shakti Singh was promoted to the post of president on Tuesday. Patna (Bihar) [India], Dec 6 (ANI): The Akhil Bharatiya Vidyarthi Parishad (ABVP) has bagged three out of the five posts in the central panel of the Patna University Students' Union (PUSU), while the remaining two seats were won by the student wing of the Janata Dal (United). Hyderabad (Telangana) [India], Oct 7 (ANI): After a gap of eight years, Akhil Bharatiya Vidyarthi Parishad (ABVP) swept the student union elections at the University of Hyderabad, winning all six posts of office-bearers. New Delhi [India], Sep 16 (ANI): The Left Unity has established a significant lead over the Akhil Bharatiya Vidyarthi Parishad (ABVP) on all four positions in the Jawaharlal Nehru University Student's Union (JNUSU). New Delhi [India], Sep 16 (ANI): The results for the Jawaharlal Nehru University Student's Union (JNUSU) elections are likely to be released on Sunday after the counting of votes resumed on Saturday evening.